A few weeks ago we started our Identified series and established that the book of Ephesians was written to God’s holy people who are faithful followers of Jesus Christ. We learned how to claim that identity as our own by giving our lives to Jesus. Now, let’s dig into the first chapter of Ephesians to learn more about the identity we’ve received as God’s chosen holy people. There are a lot of places we can look to find our value and worth, but the only one that’s true is the Word of God. Our Heavenly Father has gone to great lengths to make us His own special treasure, so let’s allow Him (and only Him) to give us our labels. Ephesians 1: 3-8 – All praise to God, the Father of our Lord Jesus Christ, who has blessed us with every spiritual blessing in the heavenly realms because we are united with Christ. 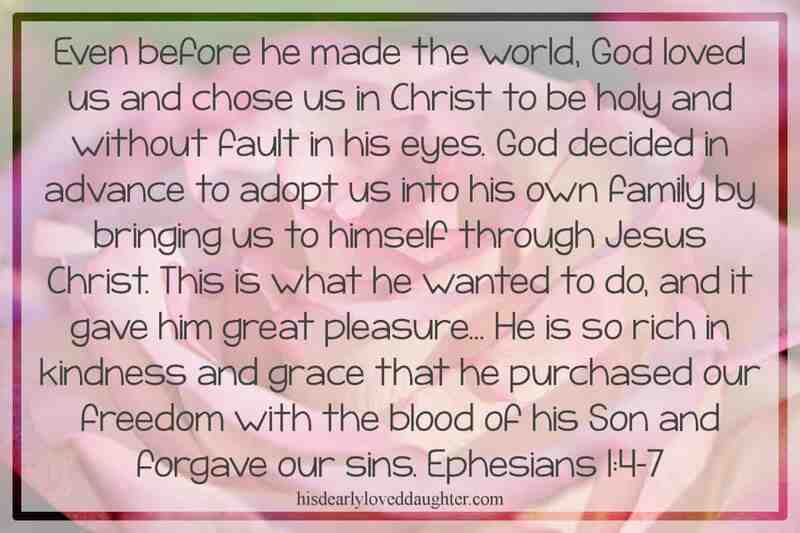 Even before he made the world, God loved us and chose us in Christ to be holy and without fault in his eyes. God decided in advance to adopt us into his own family by bringing us to himself through Jesus Christ. This is what he wanted to do, and it gave him great pleasure. So we praise God for the glorious grace he has poured out on us who belong to his dear Son. He is so rich in kindness and grace that he purchased our freedom with the blood of his Son and forgave our sins. He has showered his kindness on us, along with all wisdom and understanding. Ephesians 1:9-11 – God has now revealed to us his mysterious will regarding Christ—which is to fulfill his own good plan. And this is the plan: At the right time he will bring everything together under the authority of Christ—everything in heaven and on earth. Furthermore, because we are united with Christ, we have received an inheritance from God, for he chose us in advance, and he makes everything work out according to his plan. There are so many intricacies surrounding the idea of being chosen by God that we’re just not going to touch on here. How it impacts our ability to choose Him, our freewill when it comes to sin, our questions about all those people who aren’t chosen… we’re just not going to address those parts of it here. 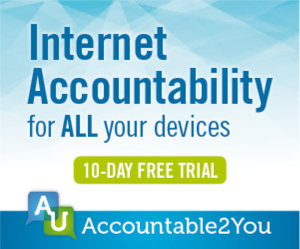 It’s complicated – let’s leave it at that. No matter what is true on all those issues, the Bible is crystal clear on this: those of us who belong to Jesus were chosen by Him before the beginning of time. What’s even more astounding to me than the fact that He chose me, though, is the reason. It’s not because of anything I have done or will do. It’s not because of what He’ll gain because of the choice. It is for the simple reason that He loves me. That’s it. The Lord God of Heaven’s Armies chose us to be His because of His great love for us. I can think of no better place to start in the rebuilding of my identity than that. No matter what: no matter what anyone else thinks about me, says about me; no matter how anyone else defines me; no matter how others presume I’ll behave, I am so very loved by the High King of Heaven that before He took the time to CREATE THE UNIVERSE, he chose me from among all the people who would ever exist to be His dearly loved daughter. In so doing, He took all the ugly sins I would commit and placed them under the blood of Jesus so that I would be holy and without fault before Him. I honestly believe if we truly grasped the full reality of that truth it would be all that would ever matter to us! No one could ever make us feel inferior or unworthy in any situation. We’d move through life with confident intention, knowing we’ve been chosen to be a part of God’s good plan for the world. We’d never find ourselves pointlessly striving through our own inadequacies because we’d understand that we’ve been showered with kindness, grace, wisdom and understanding because of our position as God’s chosen. May we begin each day with a quiet moment in which we simply ask God to help us understand and live this truth! Friends, to be chosen means that we have been united with Christ. When God looks at us, He sees us as one unit with His Son. Like a husband and wife become one in marriage. (But because of His perfection, even more complete!) Forever, inseparably joined and identified together. May it be how we see ourselves as well! Ephesians 1:12-14 – God’s purpose was that we Jews who were the first to trust in Christ would bring praise and glory to God. And now you Gentiles have also heard the truth, the Good News that God saves you. And when you believed in Christ, he identified you as his own by giving you the Holy Spirit, whom he promised long ago. The Spirit is God’s guarantee that he will give us the inheritance he promised and that he has purchased us to be his own people. He did this so we would praise and glorify him. As ugly as it is to face, every single one of us was born a slave. We talked about it last week when we talked about our sin problem. We simply do not belong to ourselves. We never have, and frankly, we never will – we can’t. 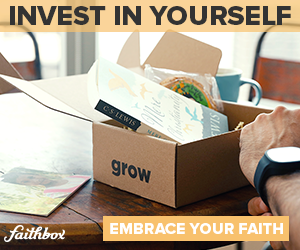 We like to think of ourselves as independent and self-empowered, but it’s just not reality. Apart from Christ, we are slaves to sin. Every last one of us. And there isn’t a thing we can do to earn our freedom from that terrible slave-master. The wonderful, amazing, too good to be true news, though, is that Jesus Christ paid the VERY high price attached to our names and purchased us from the sin that held us captive. 1 Peter 1:18-20 – For you know that God paid a ransom to save you from the empty life you inherited from your ancestors. And it was not paid with mere gold or silver, which lose their value. It was the precious blood of Christ, the sinless, spotless Lamb of God. God chose Him as your ransom long before the world began, but now in these last days He has been revealed for your sake. That’s pretty incredible already, but here’s the kicker. Here’s the part that impacts our identity and changes everything – our purchase is sealed by the Holy Spirit. After Jesus gave His life in payment for ours, God put His permanent seal on us. He stamped us with an irrevocable identity as His very own by sending His Spirit to take up residence in our hearts. It cannot be taken away. We are His forever. Colossians 1:13 – For He has rescued us from the kingdom of darkness and transferred us to the Kingdom of His dear Son, who purchased our freedom and forgave our sins. Ephesians 1:15-18 – Ever since I first heard of your strong faith in the Lord Jesus and your love for God’s people everywhere, I have not stopped thanking God for you. I pray for you constantly, asking God, the glorious Father of our Lord Jesus Christ, to give you spiritual wisdom and insight so that you might grow in your knowledge of God. 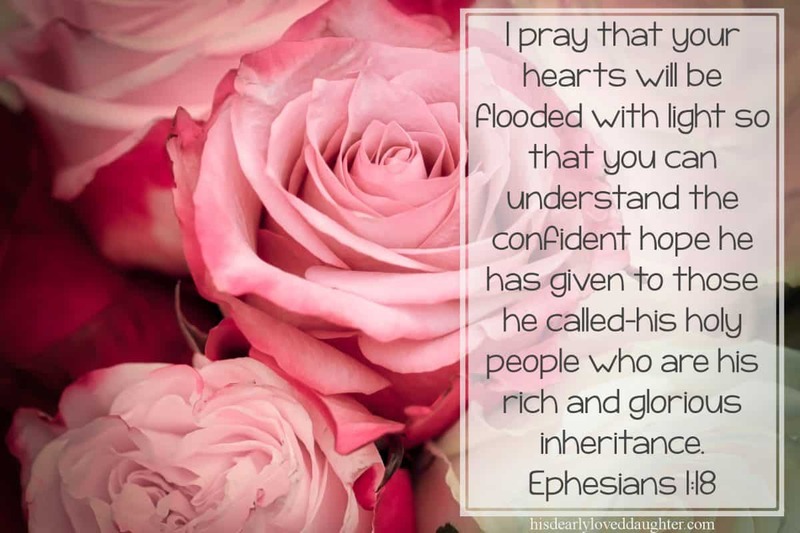 I pray that your hearts will be flooded with light so that you can understand the confident hope he has given to those he called—his holy people who are his rich and glorious inheritance. Here’s the thing about being purchased by the Lord God of Heaven’s Armies: He is a good, good God and He does not simply stop with our purchase. It would have been enough! To be set free from sin, and given identity as His own possession, that is A LOT! But it’s not where He ended it. After He had purchased us, He set us free, and then like a glorious icing on an unimaginable cake, He adopted us as His own children! That means we’re a part of His family, and therefore share in the inheritance of His Son. We are given a place of belonging, and privilege! I don’t know about you, but for me that’s huge! I have yearned for a sense of belonging for as long as I can remember, yet I’ve never really felt it here on this earth. Yet with God – with God, I do belong. In Him, that longing is filled and I am made complete. It’s not just belonging though. As children of God, we’ve been given so many wonderful treasures. Yet so many of them go unclaimed because we fail to recognize the implications of our true identity. Too often we don’t claim the confident hope we’ve been given, or the ability to gain spiritual wisdom and insight. We don’t grow in our knowledge and understanding of God like we could because we continue to live as if we still belong to sin. Ephesians 1:19-23 – I also pray that you will understand the incredible greatness of God’s power for us who believe Him. This is the same mighty power that raised Christ from the dead and seated Him in the place of honor at God’s right hand in the heavenly realms. Now He is far above any ruler or authority or power or leader or anything else—not only in this world but also in the world to come. God has put all things under the authority of Christ and has made Him head over all things for the benefit of the church. And the church is His body; it is made full and complete by Christ, who fills all things everywhere with Himself. Way back in verse three of this first chapter of Ephesians, where we started today’s study, the Bible tells us that because of our unity with Christ we have been given every spiritual blessing in the heavenly realm. In other words, those who are chosen, purchased, and adopted by God receive an identity marked by incredible privilege, yet as we’ve just discussed, the implications of this position so often go unrealized on this side of eternity. Perhaps this is because even more than we don’t understand who we are, we fail to understand who God is. It’s hard to claim the power of God in our lives if we don’t first recognize that power for what it is! It is the same mighty power that raised Jesus Christ from the dead and seated Him in the place of honor at God’s right hand in the heavenly realms. You guys, being raised from the dead (and not within moments of death either, but three whole days later) is an impossibility in itself, and required great power to accomplish. However, Jesus is not the only one in history to have experienced that miracle. (Lazarus, the Shunamite woman’s son, and a few others) The real force of the power of God was demonstrated, though, not in the raising from the dead, but in what happened after that. Everyone else in history who has been raised from the dead died again. Jesus, on the other hand, was not only raised from the dead, but He was given permanent victory over death. He never died again. He is alive today, and He will be alive for all eternity. And THEN… well, He wasn’t just raised to permanent life without purpose, but instead He was brought to heaven and seated at the right hand of His Father and given a position of authority over EVERY. SINGLE. THING. from the beginning of time, and throughout eternity. The only one who can hand out power like that has to have had it to begin with! But here’s the point – the same God who had the power to do all that has united us to His Son, and given us that SAME POWER!!!!! WHAT?????? That’s right, that’s what the passage says. Friends, we have been made members of the full and complete body of Christ, and we share in His inheritance as the Son of God. He has filled us with Himself which means we too have been given authority over everything. There is NO THING that has the power to defeat us. The only thing stopping us from realizing it is ourselves! *How about you? How does it make you feel to know that you have been chosen, purchased, and adopted by the Lord God Almighty? 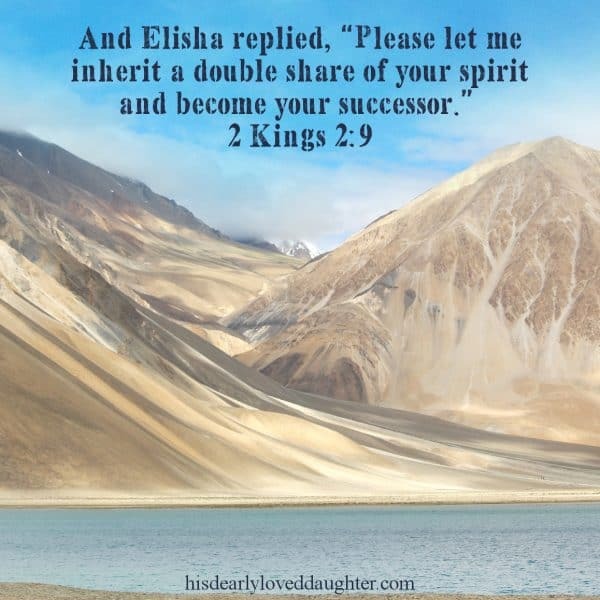 How does it make you feel to know you’ve been empowered with every spiritual blessing through the same mighty power that raised Christ from the dead and seated Him in the place of honor at God’s right hand? Tagged Adopted, Chosen, Chosen by God, Every Spiritual Blessing, Holy Spirit, Identified, identity, identity in Christ, Purchased, Set free, Who am I? Such an encouraging post. It is so easy to slip into the mistake of feeling unnoticed when the truth is that we have always been on God’s mind, even before the beginning of time! Oh man, love that! Mind blowing, isn’t it? This is such an important foundational lesson for all of us. I love walking through who we are – in Christ’s eyes! Yes. So important. Everything else is built on it. Yes. So true. Thanks my friend! I love the book of Ephesians and all of the messages on our identity in Christ that are found in that small book. Thanks for taking the time to write on this important topic and encouraging our souls with who we are in Him. Such important truths for any Christian, but especially those who have undergone life-altering struggles. Amen! I love Ephesians too Sarah. I don’t think there’s any book of the Bible that more clearly speaks to our identity. Maybe 1 Peter? Anyhow, I’m loving writing it too! This is post is filled with so much GOODNESS! Thank you for sharing the beautiful truth about our identity in Jesus in such a detailed way. I love the chosen part :). It’s crazy to think that all of this is actually true! He’s just so good. He is GOOD! That is for sure. I love the idea that He chose me. So much. In my story, it means so much. I so desperately want to be chosen, and to know that I am, by the CREATOR OF THE UNIVERSE… well, there isn’t anything better! Aww, thanks Debra. Thanks for stopping by!